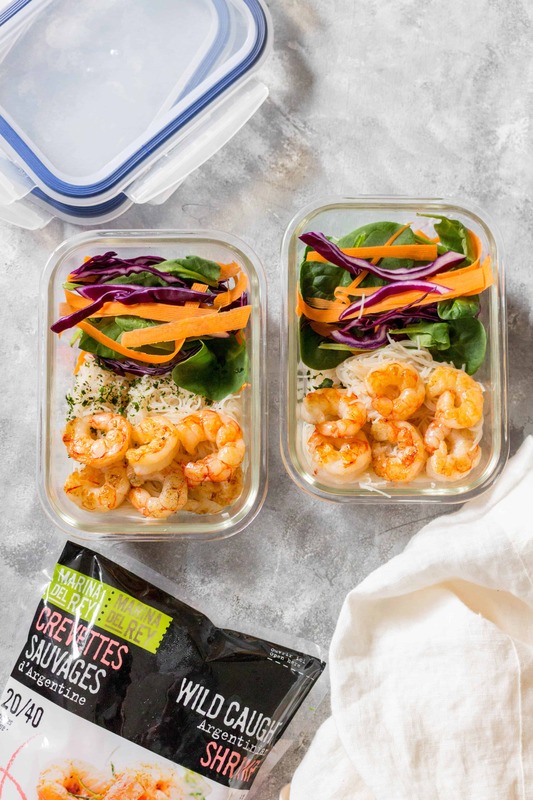 Looking for a cool and fresh meal prep? Try this Spring Roll in a Bowl! Minimal cooking, no re-heating required, and quick to make! Disclaimer: This recipe was made in partnership with Marina Del Rey. 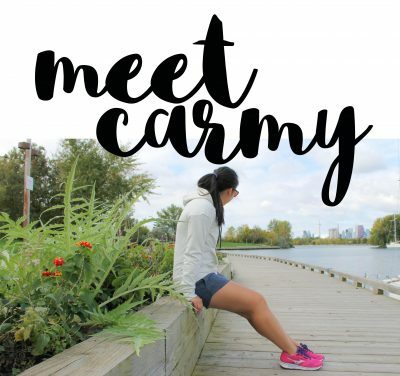 Thank you for supporting the brands who support me to make this blog possible. Have you ever had a shrimp roll? You may also know it as a summer roll or their Vietnamese name Gỏi cuốn! Either name, they’re these delicious rolls that are wrapped in rice paper and stuffed with rice noodles, shrimp, greens, and vegetables. Usually summer rolls are dipped in a peanut sauce and can either be served as an appetizer or as a meal itself. Growing up, my mom would make them for me as a meal but I would be snacking on them individually throughout the day because it was always such a treat when they were in the household. Today, I’m sharing with you a fun way to eat your shrimp rolls. You know how in Masterchef, home cooks get all fancy with their ~deconstructed~ versions of childhood classics? 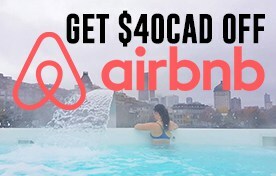 Well that’s what I’ll be doing haha. Presenting to you, a spring roll in a bowl! 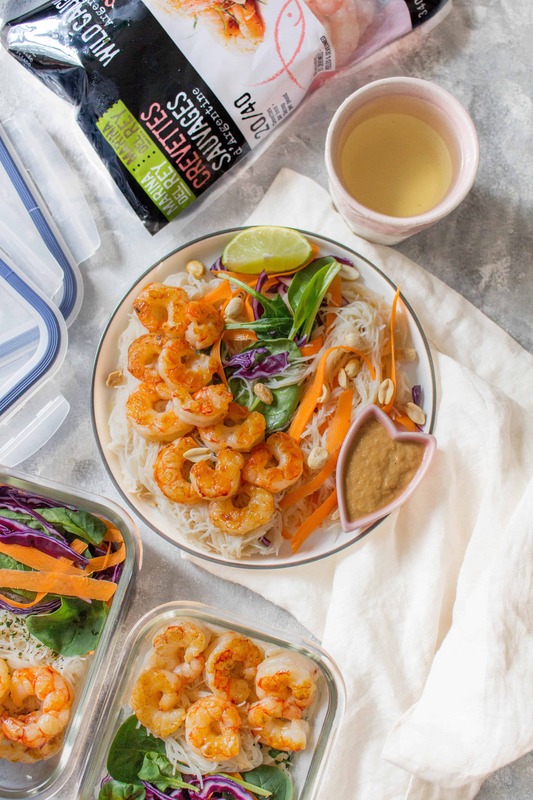 This spring roll in a bowl meal prep is perfect if you’re short on time or if you’re craving some spring rolls but you’re not in the mood to wrap them. 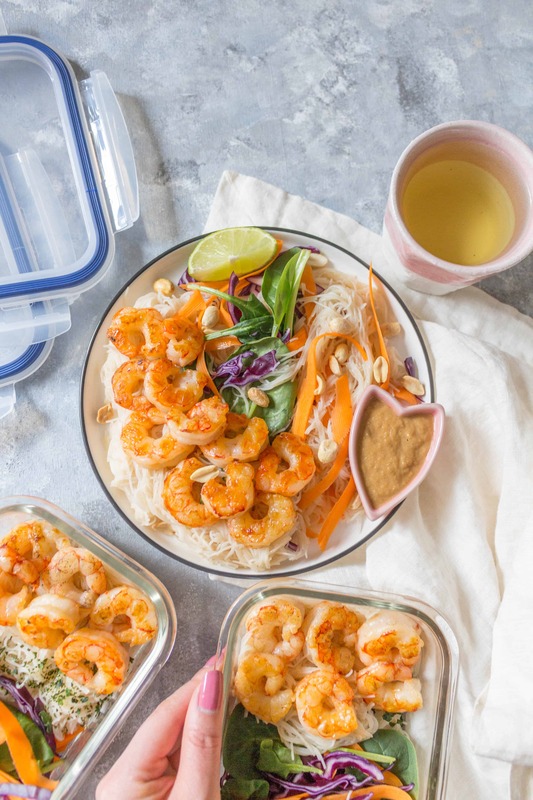 I’m using Marina Del Rey’s Wild Caught Argentina shrimp for this spring roll in a bowl recipe today as I wanted to make sure this recipe stays as healthy as possible. As Marina Del Rey’s shrimp shrimp are actually caught in their natural habitat, so they have no added antibiotics, hormones, and colour/dyes to them. It is the purest form of seafood that you could have. 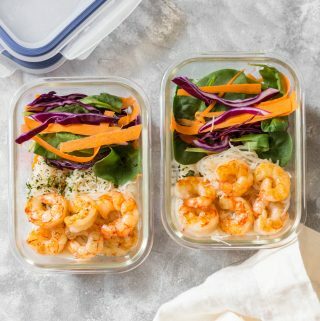 Wild shrimp are not only a cleaner option, but carry significantly lower sodium levels as well. Bonus: wild caught shrimp have a lobster-like taste so you can definitely notice the difference in quality and taste! 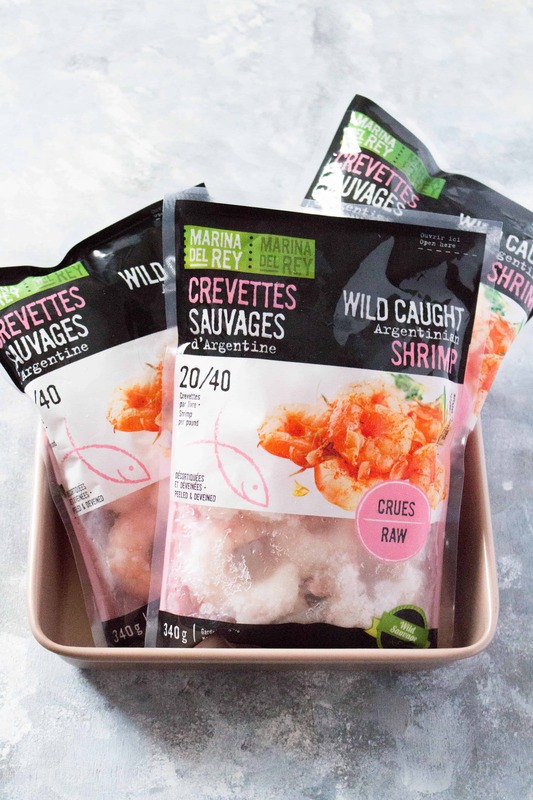 I buy my shrimp from Metro but you can also get it from Loblaws, Walmart, and Sobeys as well! The rice vermicelli noodles don’t have flavour to them so I toss it in my little dressing mix. You are welcome to change it as you wish. The peanut sauce I share is a very basic one, you can change it up by adding things like sriracha or cooking it with some garlic to change up the flavour profile. Again, this is a very customizable dish, you can change up the vegetables as well such as adding but not limited to: edamame, corn, peas, snap peas, zucchini, bell pepper, or even a coleslaw mix! I use these airtight glass containers to store my meal preps. Thaw your shrimp according to the directions on the package. 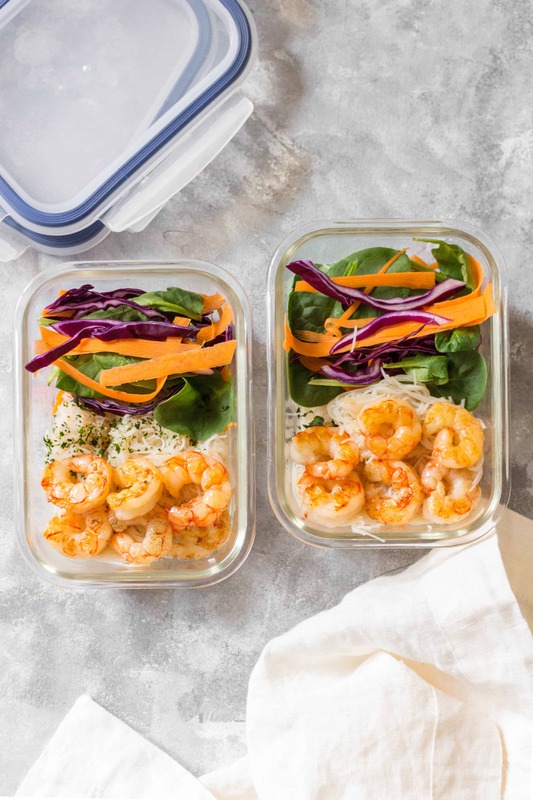 While your shrimp is thawing, bring a pot of water to boil for your noodles (two pots of water if you plan on boiling your shrimp). Once your water is boiled, add in your rice noodles and cook according to the package instructions. Heat up some olive oil on a pan and add your shrimp (seasoned with salt and pepper if you wish), to the pan. Fry until cooked through. Alternatively, you can boil your shrimp instead. Set aside once done. Once the noodles are cooking, drain and submerge in cold water to stop it from over cooking in its heat. Once drained again, toss the noodles with a mixture of mirin, honey, and soy sauce. Next combine it with your vegetables or plate them separately, it is up to you! Set the shrimp on top of the noodles and let the dish chill in the fridge. Serve cold when ready, store in airtight glass containers for up to three days. Optional: to make a dipping sauce, combine peanut butter, soy sauce, and some hot water. Serve with peanuts and basil on top if desired.